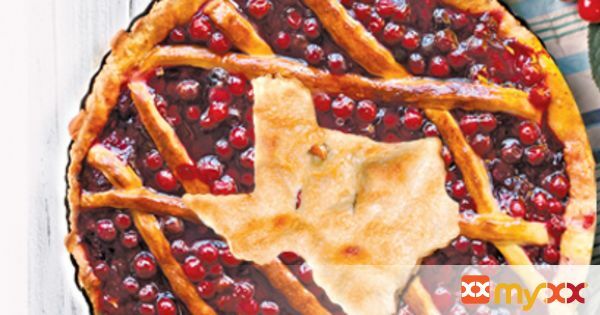 This American classic is a tasty tribute to Texas. 1. Preheat oven to 375°F. Line 9-inch pie pan with half of pastry. Drain cherries; reserve 2/3 cup syrup. 2. In saucepan, combine sugar, cornstarch and salt. Using whisk, blend reserved syrup into sugar mixture. Cook over medium heat, stirring constantly, until mixture thickens and becomes translucent. Add cherries and almond extract. Bring to boil, stirring gently. Spoon filling into pastry-lined pie pan. Dot with butter. 3. Top with remaining pastry in a lattice pattern. Save enough pastry for the Texas-shaped pastry. Trim and flute edges. 4. To prevent overbrowning, cover edge of pie with foil. Bake 25 minutes. Remove foil. Bake 20-25 minutes or until top is golden brown. 5. To make pastry shapes: Roll out second pastry on a floured surface. Using a leaf-shaped or Texas-shaped cookie cutter, cut out shapes. Gently place on baking sheet. Brush with egg white; bake at 425°F for 10-12 minutes or until golden brown. Arrange on top of baked, cooled pie.